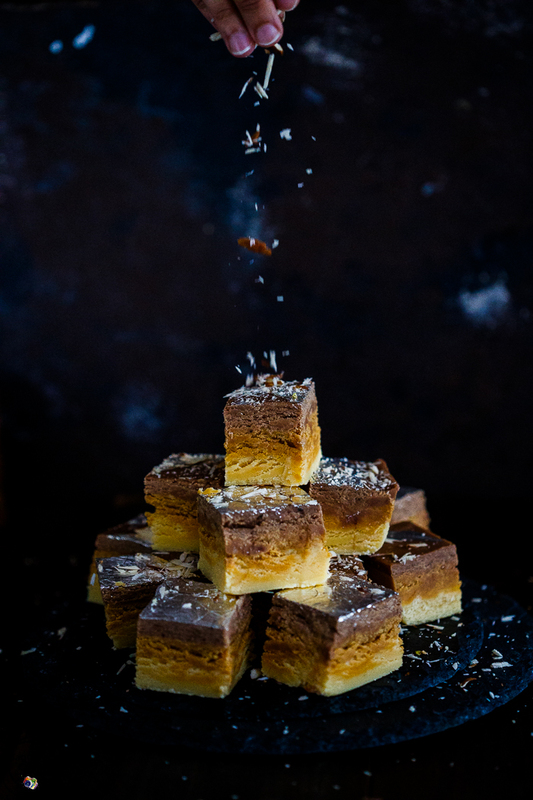 Imagine a perfect slice of Millionaire's shortbread. Now imagine a perfect square of Barfi. 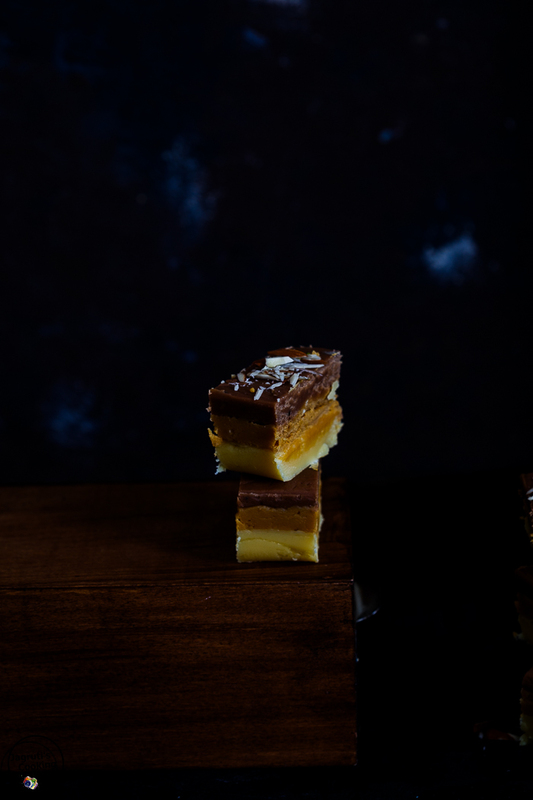 Now stretching the imagination a little, picture a fusion of the two: Vanilla, Caramel and Chocolate Barfi. Well, you don't actually have to! 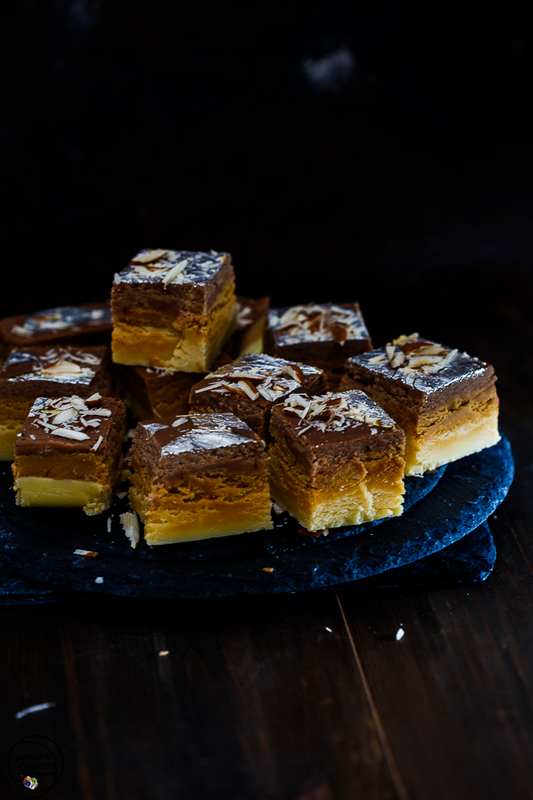 I've done all of the hard work and made these mouthwatering Millionaire's Barfi. 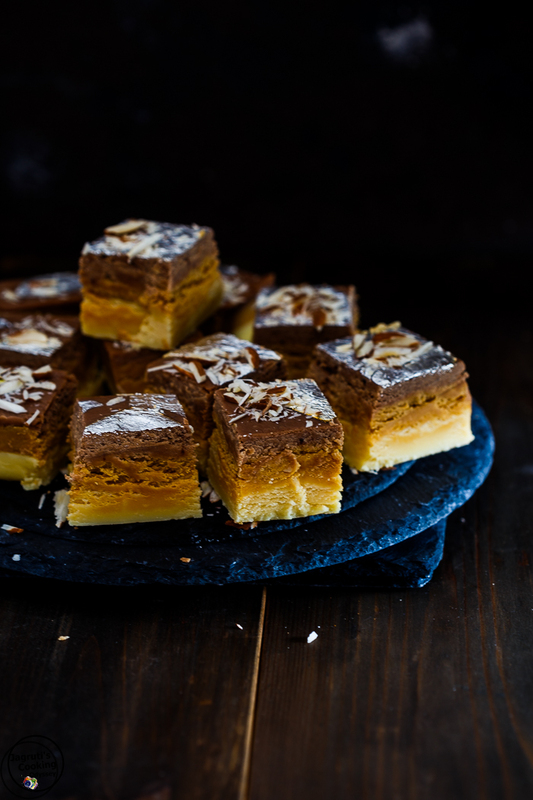 These sumptuous treats are made of three layers of differently flavoured barfi - chocolate, caramel and vanilla. Together, these layers form a perfect symphony of western flavours woven with a traditional Indian recipe. 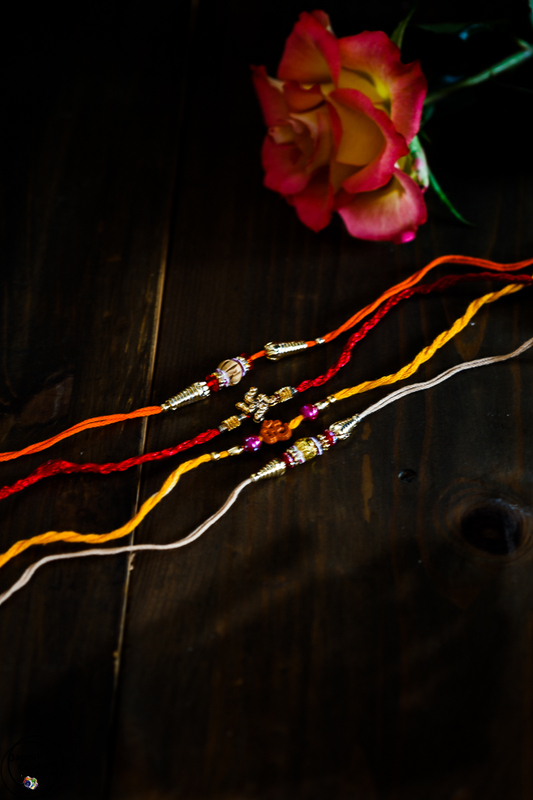 These sweets are perfect for the upcoming Indian festival of Raksha Bandhan. The festival celebrates the special bond between a brother and sister (when they aren't fighting for the remote). It's Hayley here, and I thought that I would write a post today and give my mum a break! The last time I posted was quite a while back, but now I'm home from uni I've found myself with a little spare time on my hands! I've watched my mum making Indian sweets for years, mainly because it meant that I could sneakily eat some of the mixtures, but I did begin to pick up the process over time. It was my turn to treat my brother and family by trying to make an Indian dessert. For the past few years now, I have been cooking the main meals whenever I'm home but never really tackled too many sweet things, only dabbling in baking here and there. My mum suggested that an easy one to try was Barfi, all I had to do was not get distracted and stir constantly! Doesn't seem too bad! Now, I love authentic Indian sweets. Actually, some of the least flashy, and basic sweets are the ones that I hold dearest to my heart. The ones that my mum and dad have grown up eating, such as Sukhdi-Jaggery Fudge. Sometimes though, it is nice to change things up and change the recipe around a little. We all like millionaire's shortbread in the family (only allowed as a treat!) so I thought of adding these flavours to the Barfi. And it turned out fab! The caramel, chocolatey flavours complimented the milky barfi impeccably. Each layer stands out distinctly as you bite into the barfi but then melts together. Sumptuous! This Barfi can be made with Mawa or Khoya. 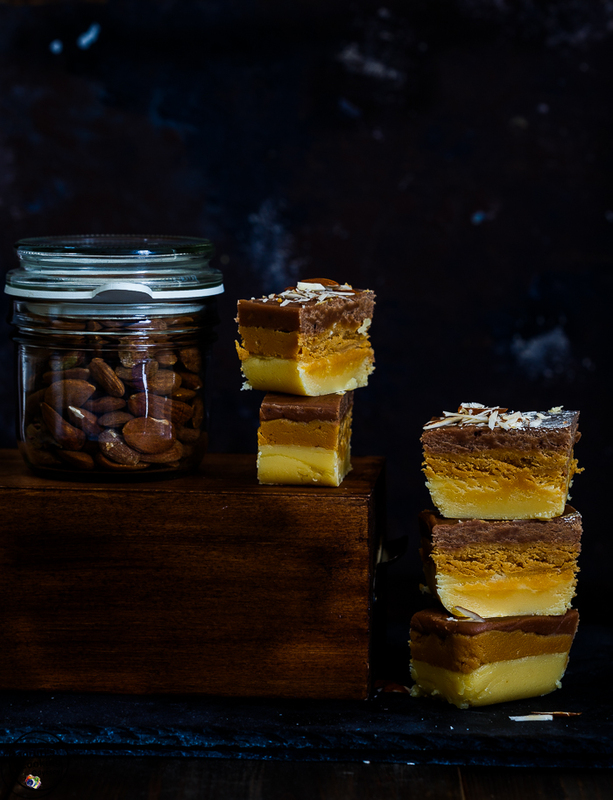 Three decadent layers of barfi with a western twist, a symphony of vanilla, caramel and chocolate flavours. Preciously rich and milky, perfect anytime. Grease one plate with ghee or unsalted butter and leave it aside.First, make the vanilla layer.Heat milk+cream and sugar in a pan and let the sugar dissolve.Let the milk simmer gently for 5-6 minutes or looks like condensed milk turn the heat off.In a heavy bottom pan heat ghee and add milk powder.Quickly start stirring so milk powder doesn't stick to the bottom of the pan.Keep stirring continuously for 4-5 minutes.Then add milk and sugar mixture to it and mix well.Keep stirring until mixture gets thicker.Turn off the heat and add vanilla extract and mix well.Mix well and spread evenly one layer over the greased plate.Leave the plate aside and start making the caramel layer.In the same pan heat ghee and lightly roast the milk powder on a very low heat.After 5-6 minutes add caramel and quickly give it a good stir. Mix well and spread evenly on the vanilla layer and leave it aside.Now make final layer which is the chocolate layer.Heat milk+Cream and sugar in a pan and simmer till you get the mixture like condensed milk.Turn off the heat.Now heat ghee in a pan add milk powder and lightly roast for 5-6 minutes on a very low heat.Add condensed milk and mix well, and add cocoa powder.Cook the mixture till a little thicker.Turn off the heat and spread the chocolate mixture evenly on the caramel layer. Apply silver leaf and press gently with a clear spatula and leave it to cool completely.Cut into the desired shape and garnished with the slivered almonds. This looks fabulous, all three flavors are my favorite. I really need to try this barfi. Stunning photography. Very well explained recipe. This dessert looks so amazing! That caramel! Can't wait to make this! Wow! Those layers are beautiful. The chocolate rainbow. Wow - stunning photos and I'm loving that ombre color in the recipe. Yum! Awesome clicks... looks so amazing... very well explained..
Gorgeous photos! These are so lovely. I love when there is a history behind the recipe. Your photos are gorgeous!!! I wish I could take a bite! This sounds spectacular and I love the mood in your photos. Oh my gosh, this looks delectable. And dangerous. I'd totally eat the whole platter!! Oh wow! 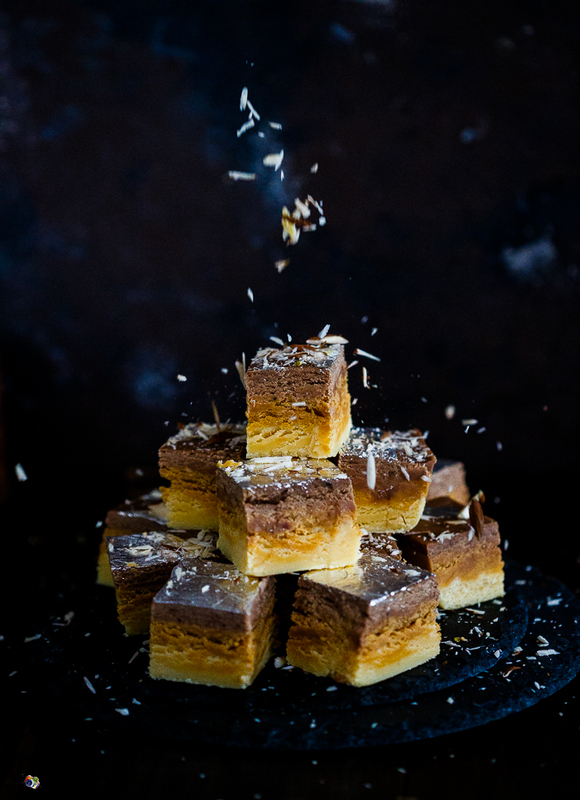 These barfi look absolutely incredible! I just love that texture and the layers. This looks scrumptious. I've never heard of barfi before, but I want to try it now! Gorgeous photos! My mouth is watering! Never heard of this before, but boy, do I know Millionaire's shortbread! I'm from Scotland, so that is a favorite! I need to explore this option too! Looks beautiful! Barfi looks delicious ..perfect for the festive season. Your photos are beautiful! I've never made Indian treats before, but I've had a few before and they were always delicious. I would love to try this! I've never had this before...sounds fun! How fun that you've stepped in to give your Mom a break and looks like quite the break it is! What a delicious sweet treat and a fun reason to celebrate! I have a brother and can totally relate, LOL! Wow. These look gorgeous. And I'm loving the chocolate caramel combination. Yum! Holy fudge! This sounds incredible and contains my three favorites! I'm bookmarking this for the holidays. Yummy! Such an original idea, sounds delicious! These look like such a special treat for a special occasion or a holiday. These 3 flavors are my favorites!! Cant wait to take a bite. Gorgeous treat for Raksha Bandhan Hayley and such a delightful combination of traditional Indian flavours and a popular western dessert! What a terrific flavor combination! So lovely! What a beautiful dessert! I have never tried it before. I need to remedy that! I had never heard of barfi but it definitely looks like something I need to try! Oh my goodness that dessert looks heavenly! I've only just started making Millionaire's Shortbread and was really surprised at how easy it was, so I'll have to try out your version! If using khoya... Then it should be equal quantity of milk powder ?